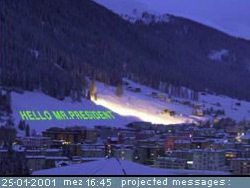 Although, the website hellomrpresident.com looks to be deserted, it still contains bits of documentation of the interactive laser hack performed at the World Economic Forum's annual conference in Davos, Switzerland in 2001. During the summit, people were not allowed to gather in public protest due to *security reasons*, so the usual demonstration format had to be redefined. Swiss media artist Johannes Gees came up with the concept of projecting digitally relayed messages by laser on to the snowy mountain slopes overlooking Davos. The messages were submitted from all around the globe and could be seen by the hundreds of journalists and thousands of politicians and business leaders attending the conference.